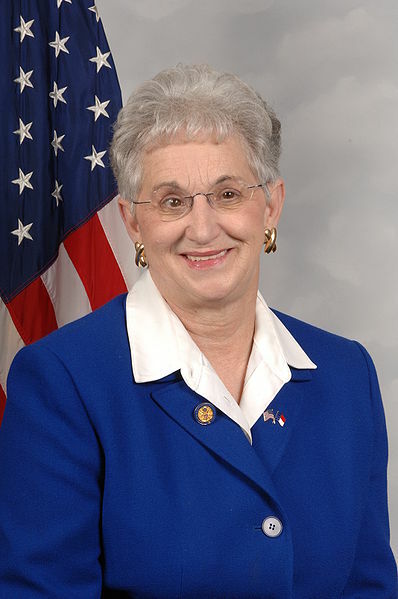 Congresswoman Virginia Foxx is the chairwoman of the Higher Education & Workforce Training Subcommittee. So she's well-versed on the complicated issue of the current student loan bubble, correct? Actually, no. It turns out that Virginia Foxx knows about as much about the specifics behind the student loan crisis as Red Foxx, who is dead. "I was the first woman to ever pay for college. I don't know why students never get jobs anymore. Why do students think college is free? Why don't students work? If you want an education that will make you out of touch with current social issues, you need to shut up and rub my feet." I went through school. I worked my way through. It took me seven years; I never borrowed a dime of money. ... I have very little tolerance for people who tell me that they graduate with $200,000 of debt or even $80,000 of debt. • Virginia Foxx went to the University of North Carolina-Chapel Hill in 1968, back when multiplayer gaming meant carrying around a burlap sack full of sheep knuckles. According to the National Center for Education Statistics, in 1968, the average yearly cost for tuition, room, and board for a public university was $1,245. In today's words, that is one thousand two hundred and forty-five dollars for a year's worth of college. For today's average college student, that dollar amount is roughly equivalent to the cost of a textbook and a garbage bag. • According to Rebuild the Dream, in 1968, seven years at UNC Chapel Hill, adjusted for inflation, cost $46,100. That same education now would cost more than $140,000. Rebuild the Dream also notes that minimum wage was 38 percent higher in 1968 than it is now, adjusted for inflation. Just some facts and numbers and stuff to throw out there ... sometimes those are good things to consider. • According to Opensecrets.org, some of Virginia Foxx's biggest donators are PACs such as Education Management Corporation, the Association of Private Sector Colleges and Universities, as well as the esteemed, for-profit, Keiser University (Home of the Fightin' Sozes). Social policies in our country are being dictated by individuals who are make their decisions based on who donates to their campaigns, therefore rendering those policy-makers completely out of touch with their voter base. These people are completely oblivious to the current state of affairs, and yet, they are in charge of creating "solutions" to today's problems. People who operate in this manner are not thoughtful problem solvers full of meaningful analysis, they are corporate shills. Looking down the barrel of the impending student-loan bubble and saying, "I have little tolerance for those with student loan debts..." is akin to telling blind people that they should just open their eyes wider if they want to see. Foxx's comments completely expose her as someone who has absolutely no concept of today's higher education landscape. Good thing she's the CHAIRWOMAN OF THE HIGHER EDUCATION & WORKFORCE TRAINING SUBCOMMITTEE. How do people like this get elected and appointed to such positions? I have no idea. But I do know that only public service and direct action can save this country now. It's up to every single person in that state who had to take out student loans in order to subsidize skyrocketing education costs to work to make sure that someone as clueless as Virginia Foxx is no longer allowed to create social policy. The only other option is to educate Virginia Foxx, get her to admit how oblivious she was, and have her dedicate her position to making public education accessible to American citizens. The latter is highly unlikely absent several thousands of dollars in donations to her office. Maybe if our children don't take out student loans, they'll be able to support politicians who are trying to keep people powerless and uneducated. Change has to come through educating voters, and from direct action by grassroots organizations. Occupy North Carolina, Occupy Chapel Hill, Occupy Tobacco Road, this one is on you. Best of luck. I trust that y'all have little tolerance for letting the rest of us get screwed.